Defining Downtown Chicago Living in one of Chicago's finest architectural gems located in the Historic Diamond District of the Loop. Designed for flexibility, the Heritage features 358 residences with 27 different floor plans, ranging in size from 800 to 5,000 square feet (74 to 465 m2), 600 deeded parking spaces and 110,000 square feet (10,219 m2) of retail space. The luxurious Heritage, overlooking and bordered by Millennium Park, The Lake, the historic diamond district and Michigan Avenue is a two tiered, mixed use high rise, towering 57 stories. The architectural team of Solomon Cordwell Buenz & associates and the development team, led by Mesa Development, accomplished an extraordinary feat with the creation and development of The Heritage. 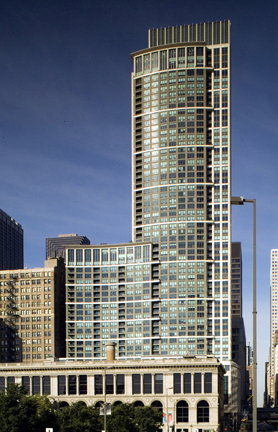 Planning for the tower began in 2000, prior to the construction of Millennium Park and well before the park became an internationally renowned public space. An important element in the planning, design and construction of the Heritage, incorporate the restoration of four historic commercial, five story facades. These turn of the century, Historic Landmark facades are at the Western base of Wabash Avenue. The limestone, sandstone, brick and terra cotta facades have been masterfully restored at a cost in excess of $4 million which included reproducing intricate terra-cotta ornamentation from archival drawings and photographs, as well as cannibalizing face brick from a demolished building, and bracing the historic storefronts while construction went on behind them. Behind these storefronts are two levels of retail space and, above them, five levels of parking. Because the residential tower is set back from the street, pedestrians see only what appears to be five-story historic facades, looking much as they have since the area was redeveloped after the Great Chicago Fire of 1871. The Heritage is the first such project to introduce modern luxury, high-rise living south of the Chicago River, in the heart of the traditional business district of Chicago's Loop. "The building makes a bold architectural statement on a site highly visible to Millennium park's millions of visitors. Graceful curves and the intricately articulated exterior of the tower relate to the grand scale of the modern office buildings to the north, while its podium of four preserved and restored historic facades respect the 20th-century cornice lines of the pedestrian-level street wall to the south." "Developing the Heritage at Millennium Park was a once-in-a-lifetime experience at a site that offered incredible opportunities and presented a number of unusual obstacles, ranging from assembling nine separate parcels to overcoming a strong market perception that high-end home buyer's won't pay to live downtown, comments Richard Hanson, principal, Mesa Development. "Overall, this development required a giant leap of faith. We believed in the site, overlooking the unfinished Millennium Park, and believed in Mayor Daley's vision for a 24/7 downtown. We had one chance to make this property everything it could and should be for decades to come, and that's what we achieved."